Cook the Tagliatelle in plenty of boiling, salted, water until tender but still firm – about 10 minutes. Drain thoroughly and toss in a large warmed serving bowl with the garlic and butter. 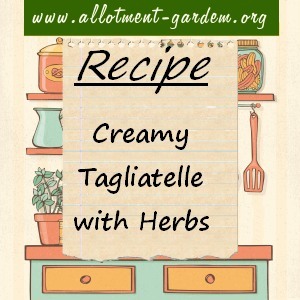 Heat the cream in a pan until just short of boiling, stir in the herbs, salt and pepper to taste. Pour the sauce over the buttered Tagliatelle and toss gently until the pasta strands are coated. Serves 4. Nice served with freshly grated Parmesan cheese and a mixed salad. Tagliatelle can be made at home quite easily, especially if you have a pasta machine but you can buy very good quality dried pasta which stores well and is very convenient. Tagliatelle is a traditional pasta shape from northern Italy. Individual pieces of Tagliatelle are long, flat ribbons about 3/8th of an inch wide.